Most lakes in the basin and many of the other over 100 nearby lakes were scooped out by glaciers. 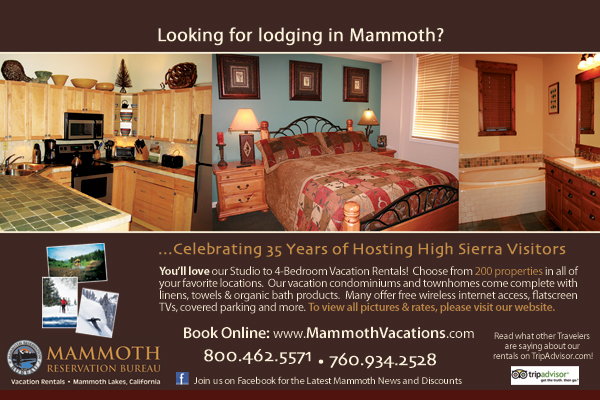 There are several lakes that give the town the name, Mammoth Lakes. The Mammoth Lakes Basin is a large glacial cirque basin that was carved by the grinding movement of glacial ice and rocks entrained within the ice. The lakes in the lower basin, including Lake Mary, Lake George, and Horseshoe Lake, fill depressions in glacial moraine deposits. The lakes in the upper basin, including Duck Lake, Shelton Lakes, and Deer Lakes, fill depressions in the underlying bedrock from metamorphosed sedimentary rocks that were scooped out by glaciers. Some of the lakes have marinas with boats for rent or you can bring your own. The lakes are stellar and only accessible during the summer months. You can drive the lower basin by continuing on Main Street - Hwy. 203 past Minaret Road. The street change names to Lake Mary Road. Follow the road and be sure you make a stop by the Twin Lakes across from Tamarack Lodge. Sit a spell, have a cool drink and watch the waterfalls. One of the interesting geological phenomenon's are the dead and dying trees near Horseshoe Lake. Dead trees were first noticed in 1990. Since then, about 170 acres of trees have died on all sides of the Mammoth Mountain volcano, especially near Horseshoe Lake. When the soil was surveyed in 1994 for carbon dioxide gas, exceptionally high concentrations of gas were found in the soil beneath the trees. What caused such high concentrations of carbon dioxide gas? The most likely sources of the carbon dioxide gas include (1) magma that intruded beneath Mammoth Mountain during an earthquake swarm in 1989; and (2) limestone-rich rocks beneath Mammoth Mountain that were heated by the hot magma. The first in the group of lakes is located three miles from the village. At the far end of the lake, Twin Falls tumbles 300 feet into Upper Twin Lake. Short hikes lead to Panorama Dome, Twin Falls, Hole in the Wall and valley view. Be sure to stop at Tamarack Lodge and walk around and have a soda. The largest lake in the Basin is nearly a mile long. This is the popular lake for fishing, boating and sailing. At the upper end is Coldwater Creek, where the John Muir Duck Lake Pass trailhead is. Hikers can hike one mile to the first of several lakes on the trail. Another very popular site for fishing and boating. Only the fisherman know where the best catch is! There are picnic areas overlooking the spillway to Twin Lakes. A man-made lake located 10 miles south of Mammoth Junction. Popular with fishermen and water-skiers, but the water will be cold. First formed in 1940 as part of the Los Angeles Aqueduct system. Fee at entrance.